Sick Care isn’t working. Healthcare has been driven by Money$ and LACK OF PERSONAL RESPONSIBILITY for the last 3 decades: Dependence on pills has destroyed lives. Insurance Claims Processing wastes money. Policy restrictions, premium and deductible increases, and job changes destroy the necessary Doctor-Patient relationship. Reliance on expensive diagnostics versus practical clinical knowledge of the patient in primary care has led to fear and distrust and avoidance. Again, insurance-based “Sick Care” isn’t working. Optimal Spinal STRUCTURE and FUNCTION with Postural Balance through Chiropractic and Manual Therapy. Proper NUTRITION, including adequate water intake, certain food avoidance and/or high quality supplementation. Adequate amounts of SLEEP and REST. Consistent, adequate EXERCISE including cardiovascular activity, flexibility training, and strength training. Healthy COPING habits and strategies. If not, we can help you get started. We believe in educating our patients so that they understand what has caused dysfunction within their Nervous System and Structure and exposing them to Holistic Care that restores Healthy Flow and Balance in the Brain and Body without drugs or surgery. When we meet you, it is our responsibility to figure out what is causing your pain and/or dysfunction, support you through an initial active treatment plan and then guide you to Wellness by introducing you to inexpensive, safe, easy to implement practices as home, changing your lifestyle to support the pursuit of good health versus waiting on disease. We have the highest quality supplements, including Detox and Weight Loss products for sale from respected companies such as Nordic Naturals, Natural Vitalty, and Garden of Life including Multi-Vitamins, Omega Fish Oil with D3, Probiotics and Digestive Enzyme, Natural Calm Magnesium, B-Complex and Anti-oxidants, Raw Fit and Wild Rose. We sell the popular Posture Pump to improve structural balance and Footlevelers Pillows for support and comfort. 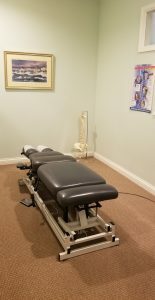 We have a Spa Room available for private Spinal and Spiritual relaxation with foot/calf massage and spinal mechanical traction with heat and acupressure sensors, aromatherapy (Doterra), infrared heat therapy, and AVE (AudioVisual Entrainment Therapy) Neurofeedback. We have Ionic Foot Detox that you can enjoy while engaging in restorative meditation or natural health video education including Forks Over Knives or the Gershon Miracle. We also have a drug-free approach to reduce anxiety, ADHD/ADD, Depression, TBI, PTSD, Addiction, and other associated brain-imbalance conditions called BRAINCORE NEUROFEEDBACK THERAPY.